Are you hosting this holiday season? Planning special meals or get togethers with the special people in your life? These recipes will fit the bill delectably. Peel and cut carrots into thin slices. Heat oil in a drying pan. Add sugar and carrots. Cook for 5 minutes, stirring regularly. Add water to cover the carrots, season with salt and cook. Once the water has evaporated, add a small amount of water to finish cooking. Allow a total cooking time of 30 minutes. While the carrots are cooking, peel potatoes and dice into cubes. Heat the oil in a frying pan and add potatoes, season with salt and pepper. Brown them over medium heat, then reduce the heat and continue cooking, stirring occasionally. 25 minutes of cooking. Cut the tenderloin into pieces. Heat oil into a large cast iron casserole dish and brown meat on all sides. Remove the meat; add the white wine and water. Add tenderloin, season with salt and pepper. Cover and cook – 25 minutes. Remove the tenderloin again and add in cream and mustard. Mix and bring to a boil for 5 minutes. Add the tenderloin and cook for 5 minutes. Serve tenderloin with the potatoes and carrots vichy. Cover with sauce. 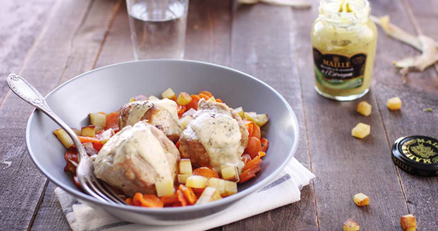 You can find lots of other recipes on www.maille.ca, as well as a $2 OFF discount coupon towards the purchase of any Maille cornichons. Chop and combine the herbs, shallot and gherkins. To make the mayonnaise, blend the egg and Dijon mustard in a food processor or blender for 15 seconds. With the motor running, gradually add the oil in a very slow stream until the mixture emulsifies. Once at the desired consistency, add the vinegar and whisk for a few more seconds. Season with salt and pepper and add the herbs to the mixture. Cover and refrigerate for 1 to 2 hours before serving. 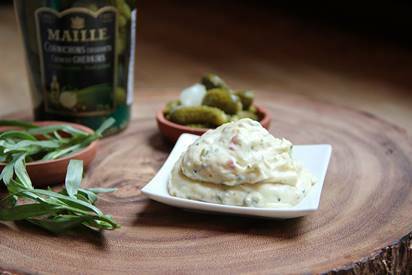 This classic tartare sauce can accompany a multitude of hot or cold dishes including fish, potatoes and meat. Serve it as a dip with in season veggies. Riso Bello’s Risotto Pronto are a quick, easy alternative to risotto that takes only 12 minutes to prepare. Using only water, they are ready to enjoy but you can also add an extra unique spin to it by adding fresh vegetables and protein! Below are suggestions on how to create your custom flavor. Bring the stock to a boil, then reduce the heat and simmer. Peel the fennel, reserving any fronds as a garnish if desired. Cut the fennel in half and remove the woody centre core, then cut into 1 cm cubes. Add any trimmings to the stock for added flavour. In a heavy saucepan, heat the olive oil and 25g of the butter, add the onion and fennel, cook over a low-medium heat for 4-5 minutes to soften the vegetables. Add the rice and cook for about 2 minutes, stirring frequently, until the rice is translucent and well coated. Add the vodka and continue to cook for 2 minutes, or until it has been completely absorbed. Add a ladle of hot stock and simmer, stirring until it has been absorbed. Continue adding the stock, a ladle at a time, letting each addition to be absorbed by the rice before adding the next. After 18-20 minutes check for the required ‘’al dente’’ texture: the rice should be tender but with a firm bite in the centre and offer a creamy moist consistency. Remove the pan from the heat, add the parmesan, remaining butter, smoked salmon, juice and zest of the lemon, stir in well. 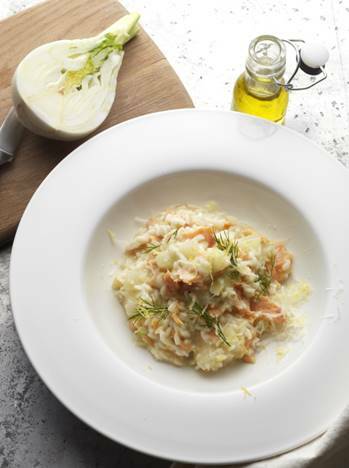 Cover the risotto with a lid, then let it stand for one minute before serving, garnish with any reserved fennel fronds and serve.